Sentinels swarm. Smith Clones. Neo Flies... but perhaps not even a Chosen One gifted with astonishing new powers can stop the advance of the Machines. Neo. Morpheus. Trinity. They're back for the powerful second chapter of The Matrix trilogy, and exciting new allies join them in the struggle against foes who are cloned, upgraded and closing in on humanity's last enclave. Back, too, are the Wachowski Brothers and producer Joel Silver, ex..
Own Matrix Reloaded DVD from Deff, DVD, Blu-Ray & 4K Video Specialists - Free UK Delivery.. Perception: Our day-in, day-out world is real. Reality: That world is a hoax, an elaborate deception spun by all-powerful machines of artificial intelligence that control us. Keanu Reeves and Laurence Fishburne lead the fight to free humankind in the see-and-see-again cyberthriller written and directed by The Wachowskis - and the winner of four Academy Awards.Special Features Written Introduction By The Wachowskis, Philosophers Commen..
Set in the 22nd century, The Matrix tells the story of a computer hacker (Keanu Reeves) who joins a group of underground insurgents fighting the vast and powerful computers who now rule the earth. 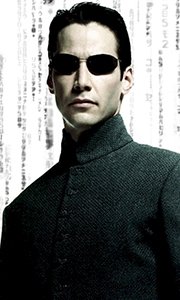 In addition to amazing effects, the stellar cast, including Laurence Fishburne, Carrie-Anne Moss, Hugo Weaving and Joe Pantoliano, helped make The Matrix a modern sci-fi classic.Special Features In-Movie Experience! As You Watch, Experience .. Perception: The Everyday world is real. Reality: That World is a hoax, an elaborate deception spun by all-powerful machines of artificial intelligence that control us. Mind-blowing stunts. Techno-slamming visuals, Megakick action. Keanu Reeves and Laurence Fishburne lead the fight to free humankind in The Matrix, the cyber thriller that you will watch again and again. Written and directed by the Wachowski brothers (Bound), the story sea..
Own The Matrix Trilogy 4K Ultra HD from Deff, DVD, Blu-Ray & 4K Video Specialists - Free UK Delivery..
3 Monumental Movies unleashed in the jaw-dropping splendor of 1080p Blu-Ray hi-def3 In-Movie Experiences that take you inside the Matrix universe as never before.3 Dazzling Blu-Ray each containing spellbinding hours of bonus material.Films The Matrix Matrix Reloaded Matrix RevolutionSpecial Features Written Introduction By The Wachowski Brothers, Commentaries By: Philosophers: Dr. Cornel West And Ken Wilber, Critics: Todd Mccar..